For the Old World, caught up in the traumas of a bitter conflict, America's Indianapolis 500-mile race was a New-World beacon of auto-racing speed and excitement during the 1940s. While racing stopped in Europe in 1939, the Indy 500 raced on in 1940 and '41. The post-war years brought new exotic machines including Fageol's twin-engined four-wheel drive car, the front-drive Blue Crowns, and rear-engined Tucker Millers. In addition the first Kurtis racers and the awesome Novi debuted. 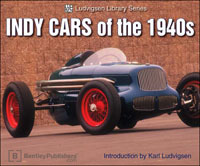 This Ludvigsen Library book brings to dramatic life the spectacle and excitement of the 1940-1949 era at the Speedway.